Horticultural Apron Pouch ONLY  Run-Out - Very few left! Horticultural Apron Pouch ONLY© 2017 – add the belt for only $8 extra! Exceptionally strong apron pouch. Reinforced for longer life, while still holding its shape. The large capacity pouch provides easy access and portability for various equipment and accessories while out in the field. Perfect for storing twist-ties, stocking ties, vine clips, tape-tools, fence nails and staples. 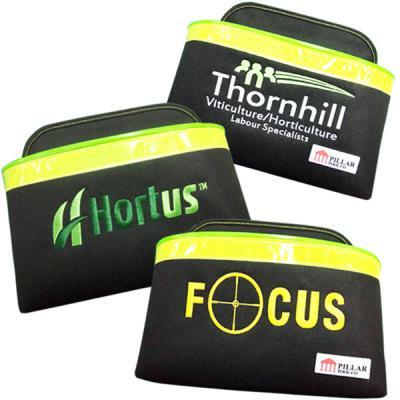 Available as a stand-alone apron pouch and belt 'kit', or customised with attachments to suit specific users. Optional attachments include: secateurs scabbard, lopper scabbard, water bottle holder and shoulder harness. Our high quality Horticultural Apron Pouch and Belt Kit System© has been designed and engineered in New Zealand to meet the requirements of the Horticultural, Vine and Orchard Industries and is 100% work-safe compliant. Please note: as this is a Run-Out Sale product, our refund or warranty obligations do not apply. Material Constructed from lightweight, heavier-duty reinforced polyester (grade 1200-D), PVC coated and UV treated fabric. One of the toughest woven fabric materials available, designed for extra-long life. Eyelet Holes Two 5mm eyelet holes within the base of each pouch helps drain away water. Stitching Thread 100% heavy-duty high tensile UV-treated polyester thread. Double-stitched where extra strength is needed. Inner Bag Dividers Reinforced and stiffened inner dividers for separating items within the bag. Velcro attached for removal or adjustment. Designed to hold bag shape. Inner Bag Pouches Two inner pouches with velcro flaps for secure storage of a cellphone or wallet. Now using a lighter easier to use fabric. Front Outer Edging Hard-wearing, top outer-edging on bag front. Stiffened to hold its shape. Made from solid vinyl piping for extra durability. Vinyl Base Plate Velcro secured inner, 85mm wide, heavy duty vinyl base plate to hold bag shape and resist penetration damage from sharp items held in pouch. 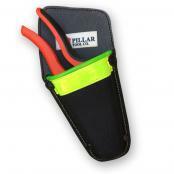 Hi-Viz Band Polyester webbing band for better visibility and safety. Great for ID marking with a permanent marker for personal ownership. Riveted Corner Joins Heavy-duty knurled rivets, reinforced with washers on corner joins for increased bag strength. Top Corners Reinforced and rounded for free clearance of scabbard deployment. Left or right handed. Bottom corners are newly reinforced to sustain better wearing. Lower Front Corners Reinforced corners, double skinned with durable vinyl ‘caps’. Riveted Belt-Loops 50mm heavy-duty PVC webbing belt-loops, stitch/riveted onto the bag's reinforced solid vinyl backing plate. Designed for hard wearing and durability. Belt Adjustable Waist Belt (sold separately). 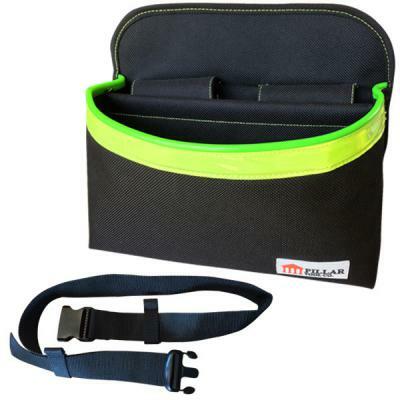 Constructed from UV treated 50mm wide heavy-duty PVC webbing fabric. 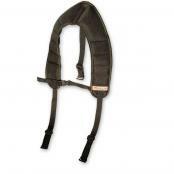 Fully adjustable with belt-holding loop. Easily clicks on and off with an industrial glass fibre reinforced polymer buckle. Now with a longer 1.6 metre length. The best pouch I have ever warn, so much more comfortable with the wider strap. Very good quality, I think it will last a life time very happy.